32 character high-contrast, alpha-numeric liquid crystal display with back lighting for night-time visibility. Tactile switches, with beep, for selection purposes. Automatic cancellation of faulty friction tests. Manual cancellation of any test if required. 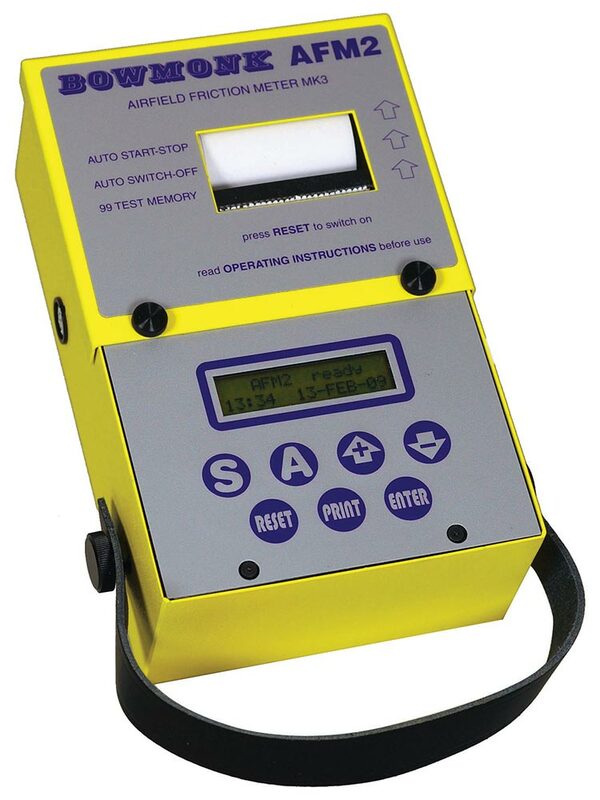 Provides for temporary suspension of friction testing with no loss of recorded data. Stores up to 99 friction readings. Provides each third of runway and operator identification. Permits field programmable airport name runway and operators through keypad or bar codes. 128k byte CMOS memory with battery backup. No connection to vehicle required. Built-in 6 volt rechargeable battery (external voltage for battery recharge 9v to 18v DC) powers unit for at least 12 hours. Can be recharged from main power pack or car cigarette lighter outlet. Built-in temperature compensated accelerometer records runway friction coefficient in compacted snow and ice conditions.